Handles virtually any rigid containerCan fill virtually any rigid containers – glass, plastic, fibre and metal cans at rates up to 60/minute. This line offers a highly reliable, accurate and efficient way to automate rigid container powder packaging lines. Can be installed with JDA capping and labeling machines for a complete bottle/canning line. 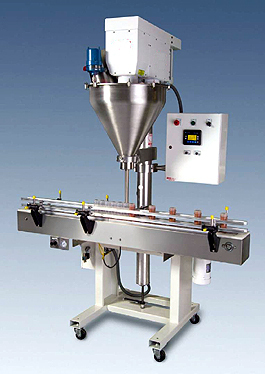 Comes with an open base frame with a mechanical jack to easily adjust for different container heights;automatic bottle indexing with no bottle – no run sensor; and a stainless steel conveyor.